A More Christlike God – A More Beautiful Gospel from Plain Truth Ministries on Vimeo. 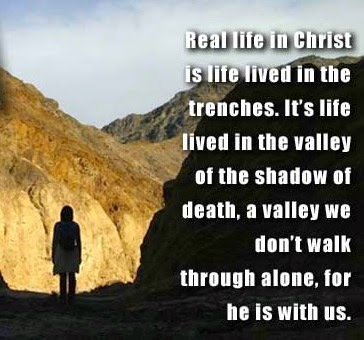 After Jesus had said this, he went on ahead, going up to Jerusalem. As he approached Bethphage and Bethany at the hill called the Mount of Olives, he sent two of his disciples, saying to them, "Go to the village ahead of you, and as you enter it, you will find a colt tied there, which no one has ever ridden. Untie it and bring it here. If anyone asks you, 'Why are you untying it?' tell him, 'The Lord needs it.'" Those who were sent ahead went and found it just as he had told them. As they were untying the colt, its owners asked them, "Why are you untying the colt?" ﻿Late March or early to mid-April is usually the time when we celebrate the twin Sundays—Palm Sunday and Easter. Luke 19:28-44 describes the background of what has come to be known as Palm Sunday. This day, and events of the week that follow, serve to remind us of Jesus' entry into the city of Jerusalem, of the events of the last few days of his earthly life. This week, often called Passion Week, is a study in contrasts. It begins with Jesus' "Triumphal Entry"—when he is welcomed by the crowds somewhat like a conquering military leader—and ends with Good Friday—the day of his crucifixion. Hailed on Sunday as a king—crucified on Friday, along with two common criminals. This day, and this week is a time of contrast, a time of irony and of drama. I remember when I first heard these kind of statements and sort of cringed. I was suspicious that those who echoed Philip Yancey or Fr. Richard might employ them to imply, "So it doesn't matter what you do." I don't think I hear Jesus saying, "It doesn't matter what you do," and in fact, that's certainly not what Yancey or Rohr are implying either. I believe it's pretty obvious that God (through Christ and in these two fine teachers) wants us to love others and emulate his grace and mercy in our lives. That matters a lot! And it seems God has also made it clear that harming others, or judging and condemning them is something he'd want us to turn from as we grow up. Discovering God's infinite love for us isn't simply a green light for an "anything goes" attitude. But implications and suspicions aside, the more I soak in the New Testament Gospels and epistles, and as I continue through to the early church fathers and mothers, the more I see how and why these opening aphorisms are exactly right. First, consider the phrase, 'there's nothing you can do to make God.' This is absolutely true: no one can 'make God' do or be anything other than what he is. That is, God loves us with an infinite love, because God IS love ... but nothing in heaven or earth or under the earth can constrain God to love us or not love us. His love is what the ancient theologians called a 'self-donation.' We don't seduce his love by being either adorable or pathetic -- his love flows entirely from his nature and is utterly voluntary. He is "moved to compassion," not because we 'trigger' him or manipulate him with our pleas, but rather, because God is compassion itself and his love flows without ceasing wherever and to whomever it is received. My experience of God's love may fluctuate as I welcome it or rebuff it, but God himself cannot be said to love us more or less, as if his very nature was dependent on our behaviour or jerked around by our emotional rollercoaster rides. Why not? Because for God to be God means that he is the infinite perfection of all we call goodness and love. God can't become more than perfect or more than infinite. God cannot become more loving or more God. If he could become 1% more, that would mean he's only 99% now ... and that would be 1% less than God. Get it? And he cannot become less in any way -- less God, less infinite, less love -- because that would diminish him. And to diminish God even 1% would mean he would no longer be the perfection of love -- would no longer be God. 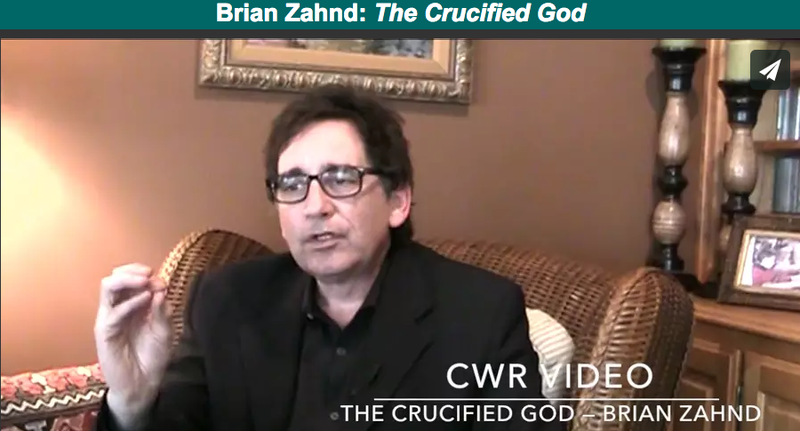 CWR Video Magazine is now online! Brief (approx. 4 minute) videos with Brad Jersak, Greg Albrecht, Brian Zahnd, Steve McVey, Bruce Friesen, Lucy Peppiatt and Ed Dunn. This episodes topics include 'Why did Jesus die? ', Suffering, Law & Grace, Reconciliation and more. 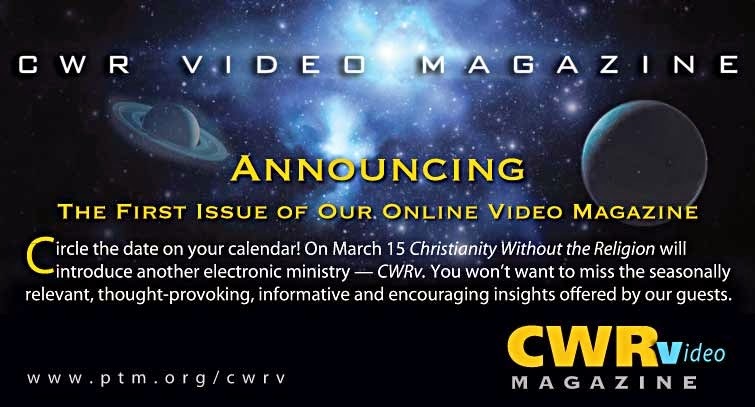 Coming Mar 15 - CWR video magazine! Coming Sunday March 15—the first issue of our online video magazine! You won't want to miss the brief, concise, thought-provoking, informative and encouraging insights offered by our guests. But why would God say, “Let there be light” and initiate Creation? The only answer I can imagine is God is love. We begin to see the sacredness of all things. As Dylan and Dostoevsky say, in every grain of sand. All of creation is a gift — a gift flowing from the self-giving love of God. Why is there light and oceans and trees and moose and whales and every grain of sand? Because God is love — love seeking expression in self-giving creativity. Unless we understand this we’ll misunderstand everything and misspend our lives. Including our sisters and brothers, all of whom bear the image of God. At the end of all things there is love. Love abides. Love endures. When the last star burns out, God’s love will be there for whatever comes after. If it doesn’t add up to love, recalculate, because you’ve made a serious mistake! Existence only makes sense when seen through the lens of love. At the beginning of time there is love. 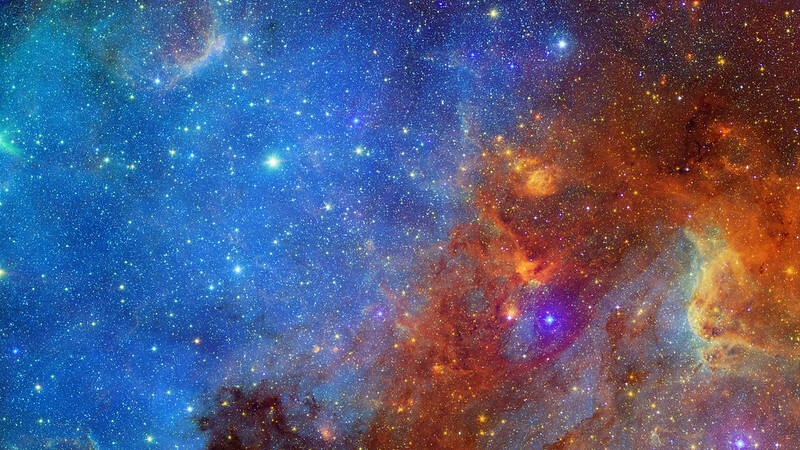 At the bottom of the universe there is love. It’s in God’s ocean of endless love that we live and move and have our being. 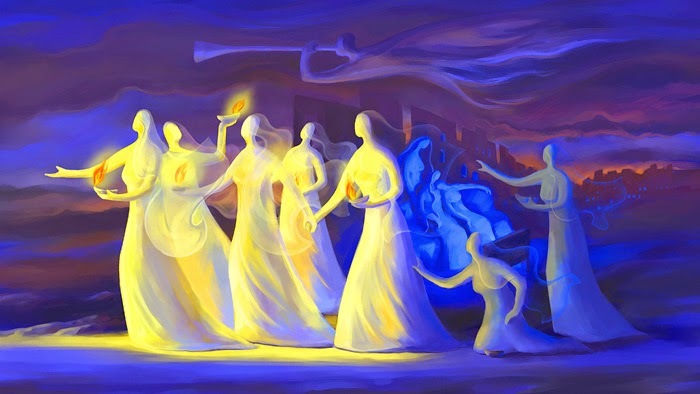 At that time the kingdom of heaven will be like ten virgins who took their lamps and went out to meet the bridegroom. Five of them were foolish and five were wise. The foolish ones took their lamps but did not take any oil with them. The wise ones, however, took oil in jars along with their lamps. The bridegroom was a long time in coming, and they all became drowsy and fell asleep. At midnight the cry rang out: ‘Here’s the bridegroom! Come out to meet him!’ “Then all the virgins woke up and trimmed their lamps. The foolish ones said to the wise, ‘Give us some of your oil; our lamps are going out.’ ‘No,’ they replied, ‘there may not be enough for both us and you. Instead, go to those who sell oil and buy some for yourselves. But while they were on their way to buy the oil, the bridegroom arrived. The virgins who were ready went in with him to the wedding banquet. And the door was shut. Later the others also came. ‘Lord, Lord,’ they said, ‘open the door for us!’ But he replied, ‘Truly I tell you, I don’t know you.’ Therefore keep watch, because you do not know the day or the hour. I wonder: What does Jesus mean by 'keep watch'? We generally associate keeping watch with 'staying ready' spiritually for the coming of our Bridegroom (Christ), whether he comes at the parousia (Second Coming) or, more likely, when we die, since all ten virgins 'fall asleep' (Jesus' favorite phrase for passing away). But why virgins? Aren't we the Bride of Christ? And what are these lamps the virgins carry? What is the oil? Who sells the oil? And how do you buy it? Why is having enough oil the criterion for entrance through the door? Do we somehow earn our way into the wedding banquet? The more I study this parable, the less I know for sure, but I'm 100% certain that Jesus thinks that having oil is really, really important. I also believe Matthew has given us a couple very solid clues in this chapter about what that oil in question might be. What is this oil that we're meant to keep in full supply? I'm discovering a few layers to the parable, as I had with the Parable of the Rich Man and Lazarus. Let's take them in order. Is the seemingly violent Jesus in the book of Revelation in contradiction to the nonviolent Jesus of the gospels? Is it true that Jesus came the first time as a lamb but he's coming the second time as a lion? Actually, the whole book of Revelation is centered around glorifying the revelation of Jesus as the lamb. It mentions him being a lion only once and in order to subvert it to show that Jesus' lion-like triumph is through being the lamb. One example is the "wrath of the little lamb" (the Greek "arnion" = lambkin, or a little innocent lamb). Typically we read that as "the wrath of the Lamb" as if it's some huge angry Lamb destroying the nations, like Lambzilla, but what we actually have here is an outlandish idea aimed at subverting our understanding of power. The pompous, monstrous beast is defeated by a little lamb. 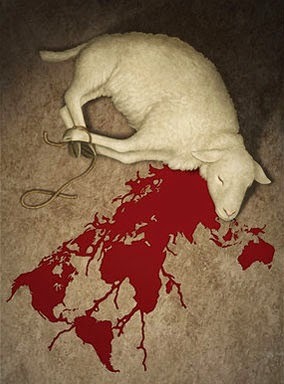 The nations are running in terror from the wrath of the little lamb. The little lamb has 7 horns and 7 eyes, reimagining the perfect power and wisdom of God as the little lamb. Paul says that the cross is the power and wisdom of God. This is foolishness to a world that believes power and wisdom is something like Caesar. But God overthrows the powers of the world through a little lamb. In the apocalyptic scene in Revelation where the Logos of God is revealed, he is on a white horse coming to make war, and how does he make war? 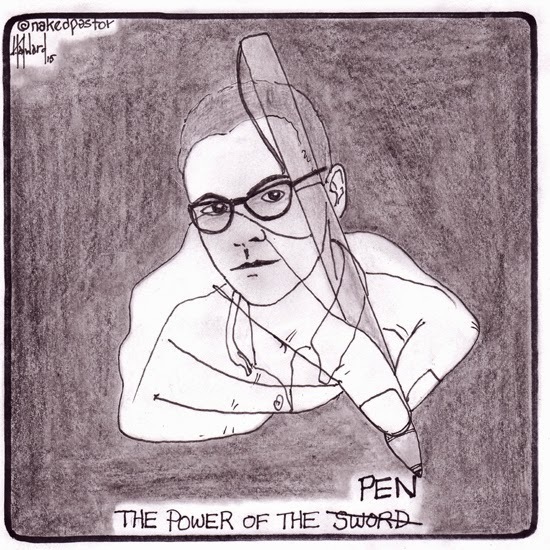 Not from a sword in his hand, but from a sword coming from his mouth. Again we have a subversion. This isn't literally a mouth sword. Jesus is striking down the nations with a message. His robe is dipped in blood before even entering into battle. It's his own blood. So the nations are under the spell of the violent domineering beast and Jesus strikes them down with the message of self-sacrificial love and shedding his own blood. This is also how his followers triumph over the beast as well, by the blood of the little lamb and by following his example of laying down their life, and by their testimony of this lamb. The book of Revelation is subverting apocalyptic imagery in light of the revelation of God in the cross. Adapted from Greg Albrecht, Spiritual Soup for the Hungry Soul, Vol. 2. 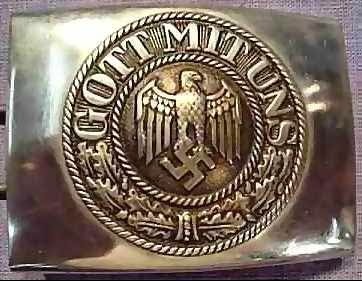 Even the Nazis assumed God was on their side! Their military belt-buckles bragged, "GOD WITH US"
Have you ever noticed how many individual Christians and incorporated religious institutions assume that God is exclusively on their side? Many seem to think that God is a member-in-good-standing of their denomination. Many seem to assume that God carries the same national passport they do and that he always supports their country in any military altercation. 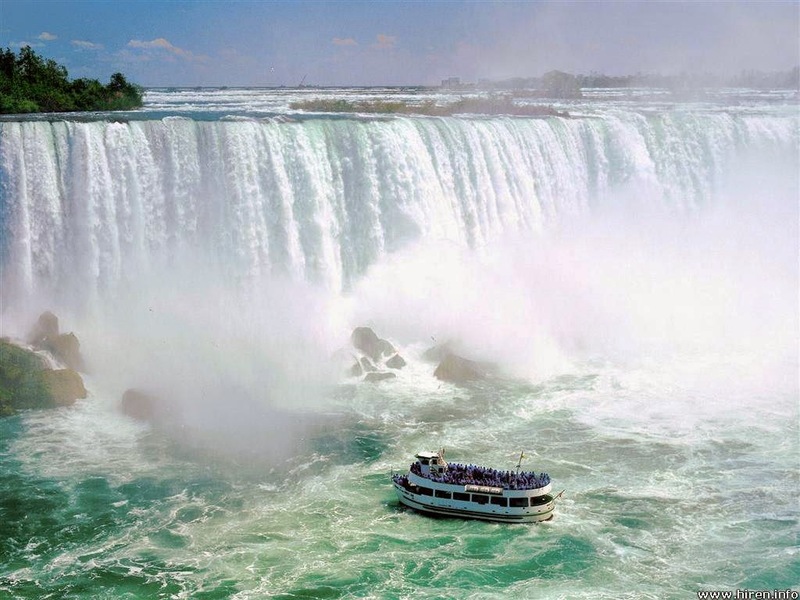 Some even act and talk as if God supports their favorite athletic team and their particular political party. But if you think about the whole idea of God being polarized and politicized for about three seconds, it really doesn’t make any sense, does it? After all the Bible clearly teaches that God loves all mankind equally. The man in our keynote passage who appeared to Joshua could have been an angel of the Lord, or this incident could have been yet another example of a theophany, an appearance of God himself. Whether it was the Lord or an angel of the Lord is really not all that important—what is important is the message given to Joshua and the context of that message. ”I was gripped by this young man’s story; I recognized my story in his. Jonathan, along with his mother Amy, describes the stress put on our kids to be amazing superheroes before they are simply human beings. In Jonathan’s case, it was the pressure to be a radical follower of Jesus and sacrificial servant of the church, no matter what the cost. He is young, and yet he chose to take on these leaders and expose their destructiveness through sharing his experiences. He is always in my thoughts because I know how much of a long-term struggle such a project can be. I’ve been there and done that, so I know exactly what it’s like. Just sharing your experiences and observations about bad leaders is risky and scary business. CWRlive Event: Brad Jersak interviews Derek Flood on "Disarming Scripture"
A God of love and genocide? For many Christians the problem of violence in Scripture can result in a crisis of faith--especially when we see how such passages have been used throughout history to justify horrific bloodshed in God's name. Moving beyond typical conservative and liberal approaches, which seek either to defend or whitewash over violence in the Bible, Derek Flood's Disarming Scripture takes a surprising and compelling approach: Learning to read the Bible like Jesus did. In this inaugural CWRlive event, Brad Jersak, author of 'A More Christlike God,' interviewed Derek Flood in order to explore this creative approach which interprets biblical violence texts through Christlike eyes.